First Line: "Nessa? It's pretty quiet, so I think I'm going to work on that new frit technique. You can close up when you're ready to go." Emmeline Dowell has carved a life for herself amongst the artists of Tucson's Warehouse District. Her shop, Shards, is getting more business, and so many people are signing up for her glassblowing classes that she's going to have to make time for even more. What she doesn't need is trouble, but that's what Em gets when she takes Allison McBride under her wing. When Allison's estranged husband shows up dead in Em's studio, the glassblower finds herself working overtime to help her new friend. Reading Through a Glass, Deadly was a case of seeing problems yet liking the book a lot anyway. There were little things like an accent that was mentioned but didn't show up until much later in the book, Chicago mobsters who seemed a tad schizophrenic (did they have scruples or were they psychopaths? ), a gratuitous murder, and a character who shows up at the end with answers to many of Em's questions. Sounds like more than a little when it comes to problems, doesn't it? 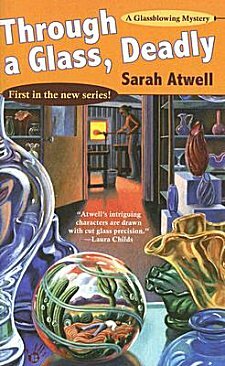 Well, what makes me call them little is the fact that the Tucson, Arizona setting, all the information on glassblowing, and-- more than anything else-- the character of Em Dowell are so enjoyable that I willingly overlooked them. A lot can be forgiven-- not that there's all that much to forgive in this book-- when the main character is so well drawn. Em is a mother hen. She dotes on two dogs she rescued from the pound, and she takes all sorts of people under her wing when she can see they need help. And she's not pushy or in-your-face about it. She's just the type of friend you'd like to have. Hardworking, smart, caring, funny. This book is written from Em's point of view, and I really enjoyed being in her head. She even handles herself rather well in a very scary situation, and has a wonderful geeky brother and a handsome police chief who's very interested in her. How much do I like Em Dowell? I've already ordered the second book in this series. Nagging plot points can be fixed, but characters like Em are few and far between. Cathy - I know exactly and precisely what you mean about a book that you can like even though you clearly see that it's not perfect. And I'm like you in that I'll do that if I like the main character. It sounds like the setting is done well here, too. Yes, the Tucson setting was done nicely, although I found it interesting that Em mentioned the perfect weather in Tucson-- when most people would qualify that by "except for the summer!" I also found all the glassblowing info fascinating. This book was published in 2008. How did you decide on it through paperback swap? Had you heard about it? Did you take a chance on the cover? How do you chose books? oops, my fat fingers!!! how do you choose? Actually Judy, my decision wasn't made at Paperback Swap. One of the online resources I use everyday is Stop, You're Killing Me. The sidebar on the left side of the homepage breaks down mysteries in all sorts of ways: Location, Job, Historical, Diversity, Genre, etc. I like keeping up with mysteries set in Arizona. I went to the Location Index, found this glassblowing series listed, thought it sounded good, and then I found a copy at Paperback Swap. I'm a reader who chooses most of my books through reading a short synopsis. From growing up in a library, titles (and those synopses) mean more to me than covers because-- in our village library-- books weren't shelved face out. I could only see the spines. Hope all my rambling helped you a bit!